Sarah brings her extensive experience of Shakespeare’s text, plays, characters and themes to her residencies. She will introduce students to the infinite interpretability of Shakespeare's plays, uncovering how the plays and characters remain relevant and exciting in our modern society. Students will actively engage with Shakespeare's language and plots, while learning to bring their own unique voice and experience to the text. Sarah also works closely with in-classroom teachers and administrators to customize curriculum, fitting the unique needs each school. Her residencies can be focused for any student, regardless of previous experience with advanced literature, theatre or Shakespeare. Sarah is an alumnus of the University of Nebraska at Omaha, where she received a Bachelor of Arts in theatre performance. 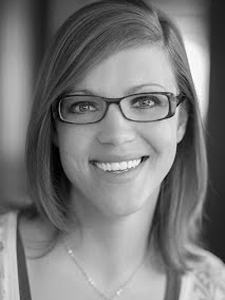 She also has a Master’s in Theatre Education from the University of Northern Colorado. Sarah has worked with Nebraska Shakespeare for the past 16 years, and in 2013 she was named Nebraska Shakespeare’s Director of Education.